March 2009's top seller was Marvel's Dark Avengers #3, the top seller for 2009 with estimated first-month Diamond orders of 96,532 copies. It was the first month (and, to date, one of only two months) in which the top-selling comic book had fewer than 100,000 copies in first-month orders. Watchmen's film release dominated the month's comics news. Check out the detailed analysis of the month's sales here — and sales chart here. March 2005's top-seller was DC's Countdown to Infinite Crisis #1, a promotionally priced dollar comic book with Diamond first-month orders of nearly 200,000 copies. Among normally priced comics, New Avengers #4 led the market with nearly 155,000 copies. Check out the sales chart here. March 2000's top-seller was X-Men #100, with estimated Diamond orders of more than 144,800 copies. X-Men #100 was the start of Marvel's Revolution relaunch to promote the upcoming first X-Men movie release. It marked the beginning of many changes in the X-Men run, notably new costume designs and a six-month time jump in each issue. The Revolution rebrand would continue until July of 2001, when the series would be once again revamped by a new entourage of authors. Check out the sales chart here. 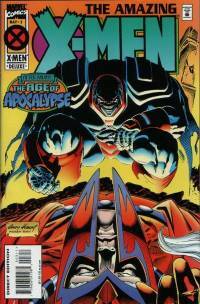 March 1995's top seller at Diamond and at Capital City Distribution was Marvel's Amazing X-Men #3, continuing the "Age of Apocalypse" storyline. Capital reported preorders of approximately 104,300 copies. After a dip in sales of the second issue in February, the third issue sold even more preorders than the first; this is reflective of the fact that retailers, ordering two months in advance, had by this point seen the initial sales from the first month of the "Age of Apocalypse." March was otherwise a tumultuous month at the beginning of the Distribution Wars. On March 3, 1995, Marvel announced that beginning with July-shipping product, Heroes World would become the exclusive distributor of Marvel comic books to the direct market. Capital City promptly filed suit under the Wisconsin Fair Dealership Law; Capital settled with Marvel later in the month, gaining the right to distribute Marvel comics for a slightly longer time. In the middle of the month, DC held its fourth annual retailer meeting; attending retailers were given few clues as to DC's ultimate plans. Marvel began meeting with retailers itself on March 24, with the first of its "Marvelution" meetings in New York City to announce trade terms. And in what remains one of the more puzzling acquisitions of financier Ronald Perelman's shopping spree, Marvel purchased trading-card publisher Skybox for approximately $150 million. Skybox was a relatively recent startup in a field that was already suffering hard times; Marvel consolidated its operations with Fleer, which it had purchased earlier. March 1990's top seller at Diamond and Capital City was Legends of the Dark Knight #7, the second issue of Grant Morrison's "Gothic" storyline. Capital's orders on the issue were 95,750 copies; overall sales were likely closer to the 400,000- to 500,000-copy range. 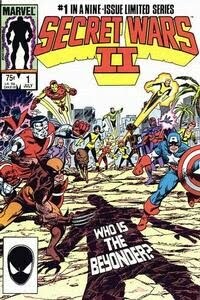 March 1985's top seller at Capital City was Marvel's Secret Wars II #1, the shorter sequel to 1984's best-selling comics series. Capital's orders were approximately 85,000 copies, meaning overall sales were probably in the half-million copy neighborhood.